A Simple Cure For PMS? According to some new studies, it may be as simple as a change in diet. The study in question, conducted by Dr. Patricia O. Chocano-Bedoya of the University of Massachusetts, Amherst, and published in the American Journal of Clinical Nutrition, followed more than 3,000 women from 1991 to 1999. Researchers found that those who consumed a diet high in the B Vitamins Thiamine and Riboflavin experienced significantly lower rates of PMS. 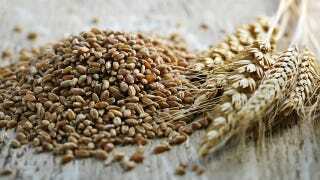 (Thiamine is found in whole grains beans and nuts; Riboflavin in meat, eggs, dairy and greens.) Adding 2-3 servings of the B's to your diet, says BusinessWeek, may "thwart PMS" — both the emotional and physical aspects. Just taking vitamin supplements didn't have the same effects. That said, the study is inconclusive — there may be other factors at work. However, one could do worse than to load up on leafy greens and whole grains at any time of the month; it seems worth a try.